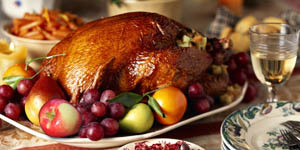 The Thanksgiving meal is an event that many families look forward to all year. And, when it’s over, it’s common for everyone to clutch their bellies and declare, “I ate too much” with a certain glee. If you want to avoid overeating or at least ensure that what you eat is healthy, add more Ambrosia apples to the feast. Here are a few apple-y ideas for Thanksgiving. It’s always a good idea to have fresh, whole apples out for the taking. Place washed and polished Ambrosia apples in a bowl and leave them where the family congregates before the meal. It’s a lot healthier than a bowl of chips or chocolates! Did you know that eating an apple before a meal makes you less likely to overindulge? There are a lot of ways to incorporate Ambrosia apples into your pre-meal snacking. Slice them thin and offer them as a cracker replacement on your cheese tray, put homemade apple chips in a bowl, serve Ambrosia wedges with hummus or cube them and serve with a yogurt dip. Remember, Ambrosia are naturally slow to brown so you don’t have to worry about them turning brown as soon as you serve them. Ambrosia apples aren’t just delicious, they’re pretty too! Use Ambrosia apples along with dried leaves and pinecones to decorate the dining table and around the home to give your house that festive fall feel. Just make sure you have that fresh bowl of apples on offer or your decorations might start to disappear. A bowl of soup before the big meal is like a nice warm up but you don’t want it to be too heavy. Try something light like an Ambrosia, Sage and Celeriac soup or something a little more hearty like a Roasted Ambrosia soup served as an amuse-bouche in espresso cups. Is your stuffing recipe stuck in the 70’s? Adding diced Ambrosia apples to your turkey dressing will change your mind about sticking with Grandma’s tried-and-true recipe. Not only does the flavour blend beautifully with traditional stuffing seasoning, it adds an aromatic flare too. Dice the apples smaller if you want a subtle apple flavour, or go bold with bigger cubes. Every Thanksgiving meal needs something green and crunchy. Ambrosia apples go beautifully in a kale salad and also make a delicious slaw. For something with a little more of a spicy kick, try an Arugula and Ambrosia Apple Salad. For many people, pie is the big finish to the meal but the big debate is always pumpkin pie or apple pie. No need to decided, you can actually make a pumpkin apple pie by layering pumpkin pie filling over Ambrosia apple pie filling. Delicious! Now, if you’re not a traditionalist, you might skip the pie and go for a lighter dessert. Poached Ambrosia apples are delectable served with fresh whipped cream or vanilla bean ice cream. And, in case you don’t have any room for dessert, they’re delicious the next day with plain yogurt. Put a twist on your adult beverages this holiday by serving an Ambrosia apple sangria. The recipe is simple. Grab a large pitcher and pour in a bottle of white wine (your choice of varietal but Pinot Gris or Gewürztraminer both work well), 3 cups of apple cider, 1 cup of liqueur of your choice (ginger, caramel or cranberry work nicely) and 2 Ambrosia apples (chopped). Stir with a cinnamon stick (optional) and serve chilled over ice. For the kids and the non-drinkers, try a simple Ambrosia apple spritzer. Fill a wine glass 2/3 with Ambrosia apple juice and top with sparkling water. Garnish with a lime slice. Or, you could create an alcohol-free sangria. In a jug, add Ambrosia apple juice, a squirt of lime juice, sparkling water and chopped Ambrosia apples. There are so many ways to add the goodness of Ambrosia apples to your Thanksgiving celebrations. Whichever form you choose, we hope you have a fantastic holiday. From the Ambrosia Apple grower family to yours, Happy Thanksgiving.